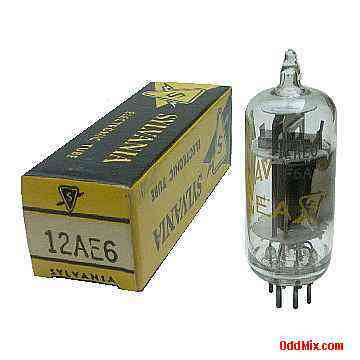 This is a genuine, vintage, 12AE6 Sylvania Twin Diode, Medium-Mu Triode Space Charge, electronic tube in it's original box. This is a collectible, discontinued, antique, collector's special vacuum tube. These miniature, lightweight, portable, compact, tubes were developed to work with the automobile 12 Volt battery as anode supply as combined detector, amplifier and avc use in automobile and ac operated receivers. Excellent for antique radio restoration projects or to set up a private vacuum tube museum. It is NOS tube - New Old Stock, unused, boxed, excellent condition. First come first serve, as only one of this rare, discontinued, historical vacuum tube available!